Keeping you in charge with battery recycling programs that meet global standards. Power Sonic’s dedication to the protection of the environment is an integral part of our company mission. Our focus on environmental sustainability sets us apart from our competitors. We understand the importance of reducing the environmental impact of our products and that is why we are continuously improving our processes. We in the battery industry are proud of the fact that lead acid batteries are the environmental success story of our time. More than 98% of all battery lead is recycled. Compared to 55% of aluminum soft drink and beer cans, 45% of newspapers, 26% of glass bottles and 26% of tires, lead acid batteries top the list of the most highly recycled consumer products. 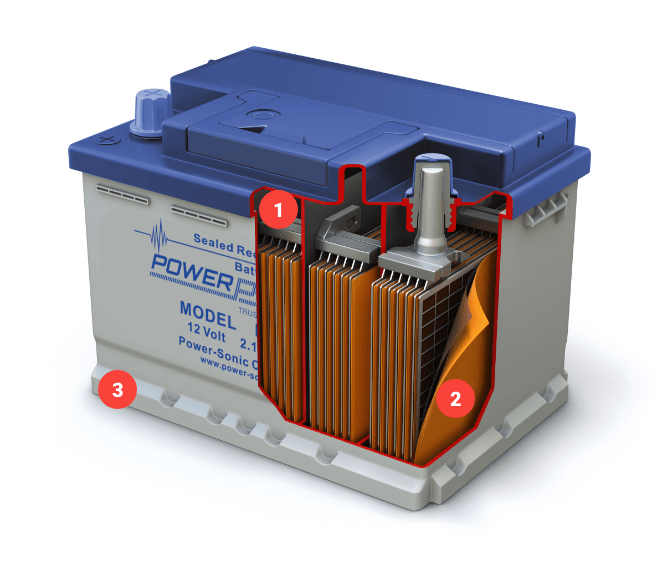 The lead acid battery gains its environmental edge from its closed loop cycle. The typical new lead acid battery contains 60 to 80 percent recycled lead and plastic. When a spent battery is collected, it is sent to a permitted recycler, where under strict environmental regulations; the lead and plastic are reclaimed and sent to a new battery manufacturer. The recycling cycle goes on indefinitely. That means the lead and plastic in the lead acid batteries that you use have been - and will continue to be - recycled many, many times. This makes lead acid battery disposal extremely successful from both environmental and cost perspectives. At Power Sonic we urge all of our customers to responsibly recycle their used batteries on every occasion. Help sustain a cleaner planet for future generations. Reduce the amount of energy needed to produce new lead from ore. Prevent toxic components entering the environment. Sulphuric acid is converted to sodium sulphate to be used in the manufacture of glass, textiles, laundry detergents and fertilisers. At Powersonic we are dedicated to caring for the environment and believe that scrap batteries should be recycled and disposed of responsibly. Power Sonic delivers new batteries to distributor. New batteries are sold and installed by resellers. The used batteries are returned to the distributor by resellers. Used batteries are collected from the distributor. Used batteries are recycled into new products. Power Sonic offer an easy to use scrap collection service provided by our recycling partner G & P Batteries. Our VRLA batteries may be disposed of within the waste battery bins we have provided at our customers locations. Any customer requiring a recycle bin for VRLA batteries, please contact us at salesEMEA@power- sonic.com or call us on (01268) 560686 and we will be happy to arrange this for you. A standard bin is designed to take up to 1000kgs. To warrant a bin, an average rate of four collections per annum is preferred. For our customers whose waste VRLA batteries do not merit the placement of a waste bin and for disposal any battery packs or cells of other chemistries, including Nickel Cadmium (NiCd), Nickel Metal Hydride (NiMh) and Lithium ion Phosphate (LiFePO4), please refer to our Take back Policy.